One summer, a small group of friends and I took a boat out on the Long Island Sound to catch blue crabs. All we needed were a few wire coat hangers tied with rope and some chicken wings. The chicken wings were threaded onto the hangers and tossed into the water. The crabs would grab onto the chicken wings and we would simply lift them up onto the boat. 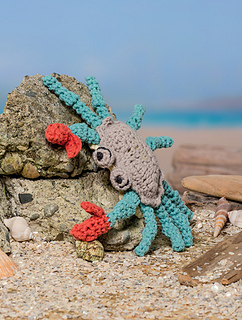 Of course, if you don’t have any chicken wings handy, you can always whip up a few crabs with this pattern and some extra skeins of yarn.